For the second time in a week, I’m in the weird position of recommending to you a book that I really didn’t like all that much. I hope that this doesn’t appear hypocritical. 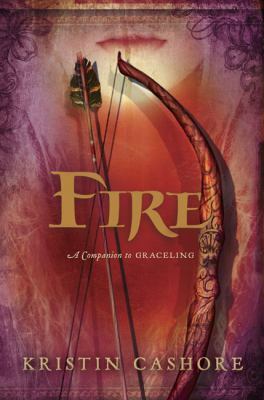 Let me just say that I didn’t like Fire (or Graceling, its partner book) because over several years of study as an English major, I learned to loathe this sort of thing. And the reason I’m recommending it to you is that I honestly think you’re going to like it. (You’re young and not so jaded!) I’ve tried it out on two students. One is finished with the book and really enjoyed it; the other is still reading (and that’s a good sign). All the professional reviews were glowing. Fire, who lives in the Dells, is the last human ‘monster’ in the kingdom. Monsters are not as we think of them; they are like typical creatures, but have extraordinary coloring and the ability not only to read minds, but to influence others’ thoughts, to control them if they aren’t strong enough to resist. Fire’s fabulous coloring includes hair that is a true red, orange and yellow. She’s is so unearthly beautiful that some people can’t resist touching her, running their hands through her hair. (Yes, if you know me, you know the author was already losing me with this.) Fire must cover herself in public to be able to travel unmolested. Her major concern with being a monster is that she not behave like her father (Cansrel), who used his powers to ruin lives and nearly destroy the kingdom. Some of the reasons I had a hard time getting through Fire were the same reasons it took me awhile read Graceling, the primary problem being that it was too repetitive. (Fire was tired of being attacked? Yeah, well, I got sick of hearing about her musings on the subject.) Other things just seems silly to me—that her presence provoked monster attacks—the monster form of raptors especially go after her. Or the constant references to her ‘monthly bleedings,’ how she had to lock herself indoors during that time or risk being shredded by monster creatures, who were especially sensitive to her at that time. I guess Cashore was trying to elevate this woman’s issue to a philosophical discussion (what should she tell Brigan’s little daughter about it? Would it hurt her psyche?) I believe this sort of thing will drive male readers away. And the inclusion of a single character from Graceling seemed artificial. Note: I tagged this as ‘mature’ because of the casual sexual relationships that many of the characters have. There aren’t any explicit sexual descriptions, but I think some parents would have an issue with the book. A war is going on, so there’s violence, too, but it’s not graphic. This entry was posted in Adventure Stories, Fable/Fairy Tale/Fantasy, Family Problems, Fiction, Mature Readers, Over 375 pages, Romance, Supernatural, Young Adult Literature. Bookmark the permalink.